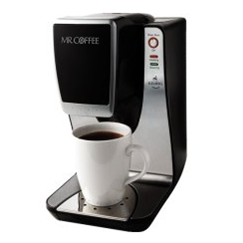 In cooperation with the U.S. Consumer Product Safety Commission (CPSC) and Health Canada, Jarden Consumer Solutions and Mr Coffee are announcing a voluntary recall for the Mr Coffee Single Cup Brewing System, Model BVMC-KG1 series. We have received reports that a build-up of steam can force the brewing chamber to open and expel hot coffee grounds and water, posing a burn hazard. Please note this recall is limited to the Mr. Coffee Single Cup Brewing System, Model BVMC-KG1 series in the United States and Canada. To determine if you are eligible to participate in this recall, you will be asked to provide several pieces of information from your brewer. If it is determined that you are eligible, you will receive a recall kit in the mail within 10 – 15 business days. Inside of the kit will be instructions on the steps you will need to take in order to receive your replacement. The first step will be to follow the directions to cut the cord and plug from your brewer, and the second step will be to use the enclosed pre-paid envelope to return the plug to us at no charge. Once we receive your return kit with the plug, your replacement unit will be shipped within 2 to 3 weeks. Pour un service en Francais, veuillez appuyer ici. ©2019 Jarden Consumer Solutions. All Rights Reserved.